I will update this list as I encounter more helpful packages. First, let’s start out with my favorite themes. By far, Seti is my favorite Atom theme for both UI and Syntax. I like a theme that maintains a dark, near (or equivalent to) black environment, but with distinguishable text colors that pop. Seti checks these boxes. Nord: Nord is supplied as both a UI and Syntax theme. It provides an “arctic” color scheme, which is a type of cool blue color. I recommend taking a look if you want something a bit lighter than Seti. 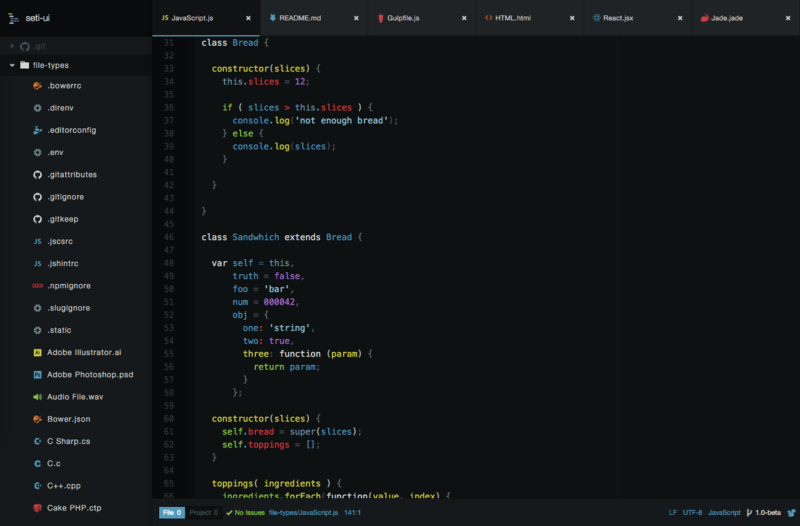 Styri: Styri is a Syntax theme with a bright, bold, and easily distinguishable color scheme. It allows for a bit more color than Seti, but for me it can be a bit distracting. That being said, if you’re looking for a more colorful environment (maybe to improve your quality of life), I’d suggest looking into it. Here is a complete list of community packages that I use, with a brief explanation on why I use each one. Alphabetized and categorized! atom-clock: I often lose track of time, but it’s important to make meetings and deadlines. I also don’t want to get lost in my IDE for hours. So, I use this clock (with seconds, as the ticking doesn’t bother me and I like the animation) to keep track of time while developing. atom-updater-linux: For easy updating with Linux, I use this package. It bugs me to keep my installation updated for newer features and bug fixes. file-icons: This gives better icons and colors based on file extension, which just makes it easier to keep track of files associated with projects. highlight-line: This relatively simple package highlights the current line in the editor, which as one can imagine is very useful. highlight-selected and minimap-highlight-selected: Similarly to the above package, this package highlights all occurrences of words you double-click. This allows for easy tracking of variables, and can help make code a bit more readable - especially when trying to parse someone else’s code. The minimap-highlight-selected works with the minimap package to show the highlighted line in the minimap. hyperclick: Allows for opening hyperlinks in your web browser from Atom, which is useful if you have URLs in your code, or are reading someone else’s. minimap: This package creates a minimap on the side of the editor, which allows you to see your place in the larger picture of the code. While not entirely necessary, I find it heavily useful in larger projects. pigments and minimap-pigments: Pigments displays colors (such as color codes) in Atom, which is very useful for previewing colors without leaving Atom. Likewise, the minimap-pigments package displays the pigments in the minimap supplied by the minimap package. sync-settings: I use Atom across more than one system, so this package keeps all of my settings and packages synchronized between systems. todo-show: This highlights all occurrences of: TODO, FIXME, CHANGED, etc. atom-beautify: This allows for in-editor beautification of a variety of languages, which h elps to keep code organized. I recommend having some sort of beautifier in your process, not as a replacement for proper editing, but as an augmentation. color-picker: Easy color picking when choosing color codes. This is incredibly helpful for me, as it allows me to visualize or pick colors without leaving Atom. tabs-to-spaces: Don’t you hate when someone uses tabs in their code and you want to throttle them but also replace all the tabs with spaces? Then this package is for you! autoclose-html: This automates HTML tag closing, which isn’t a huge deal but can save some time. Some people like automatic tag closing, and some people don’t - not a make or break packages but it is convenient. pretty-json: JSON has a wide variety of use cases, but I primarily use it in web development, so I’ll categorize it here. This allows for easy JSON formatting, which can help make code more readable. markclip: With this package, you can paste images from your clipboard into markdown, which allows for speedier editing. markdown-preview-plus and markdown-writer: These two packages add some extra support for markdown, such as allowing for markdown previewing. It makes my life easier for editing READMEs, blog posts, etc. atom-latex: Not only does this add support for LaTeX, but it allows in-Atom compilation of LaTeX. This, combined with pdf-view, makes Atom my choice editor for LaTeX. pdf-view: While this is a more general package, I primarily use it with LaTeX to preview the compiled document. language-bro: This gives support for Bro (now Zeek) syntax. language-p4: This gives support for P4 syntax. language-haskell: This gives support for Haskell syntax. There are many other popular packages, such as script (which allows for running code in Atom), but these are the ones I prefer to use.